Prime Minister of Ukraine Volodymyr Groysman considers inadmissible the presence and participation of representatives of the aggressor country, the Russian Federation, in any institutions that advocate international law. 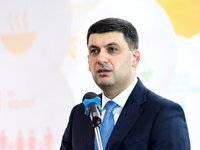 "We understand that the situation is complicated and every day our enemy uses various options to force representatives of other countries to soften their policy towards the Russian Federation," Groysman said during an hour of questions to the government in the Verkhovna Rada, commenting on the recent PACE resolution. The premier stressed that Ukraine's position should be tougher from the point of view of legislative and executive authorities, and it is also necessary to strengthen coordination with international partners to force Russia to fulfill its obligations. "The presence and participation of the aggressor country in any institutions that today advocate, in particular, international law, is unacceptable," Groysman added.